We present a general method for rapid prototyping of realistic character motion. We solve for the natural motion from a simple animation provided by the animator. Our framework can be used to produce relatively complex realistic motion with little user effort. We show that realistic motion can be achieved by enforcing a small set of linear and angular momentum constraints. This simplified approach helps us avoid the complexities of computing muscle forces. Simpler dynamic constraints also allow us to generate animations of models with greater complexity, performing more intricate motions. A jumping motion with sharp turns. The simple input motion only contains 5 keyframes . A gymnastic handspring motion. Positional constraints are detected both on the feet and the hands . A high-bar motion with a handstand at landing. The same algorithm applies to both ground-contact and bar-contact stages. A hopscotch motion containing hops, broad jumps, and a spin jump. Each hop only contains 3 keyframes in the input motion. A running motion sequence. The upper body is completely stiff in the input motion. An ice-skating motion with an 180-degree turn in the air. Sliding constraints are detected at the ground-contact stages. 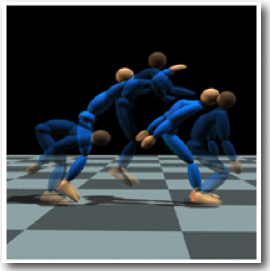 An karate kick motion created by an iterative optimization process.